The Federal Railroad Administration and Federal Motor Carrier Safety Administration said late last week that they are no longer pursuing the regulation that would require testing for the fatigue-inducing disorder that's been blamed for deadly rail crashes in New York City and New Jersey and several highway crashes. The decision to kill the sleep apnea regulation is the latest step in President Donald Trump's campaign to drastically slash federal regulations. The Trump administration has withdrawn or delayed hundreds of proposed regulations since he took office in January — moves the Republican president has said will help bolster economic growth. Late last year, the FRA issued a safety advisory that was meant as a stopgap measure urging railroads to begin sleep apnea testing while the rules made their way through the legislative process. Without a regulation mandating testing, which would have needed approval from Congress, regulators couldn't cite trucking companies or railroads if a truck or train crashed because the operator fell asleep at the helm. "It's very hard to argue that people aren't being put at risk," said Sarah Feinberg, the former administrator of the FRA, who had issued the safety advisory in December. "We cannot have someone who is in that condition operating either a train going 70 mph or operating a multi-ton truck traveling down the interstate. It's just not an appropriate level of risk to be exposing passengers and the traveling public to." The National Transportation Safety Board said it was disappointed the agencies decided to scrap the "much-needed rulemaking." "Obstructive sleep apnea has been in the probable cause of 10 highway and rail accidents investigated by the NTSB in the past 17 years and obstructive sleep apnea is an issue being examined in several, ongoing, NTSB rail and highway investigations," NTSB spokesman Christopher O'Neil said. "It's very hard to argue that people aren't being put at risk." The NTSB has long recommended sleep apnea testing for engineers, and Metro-North and the Long Island Rail Road started requiring it after finding the engineer in a 2013 Metro-North crashhad fallen asleep at the controlsbecause he had a severe, undiagnosed case of sleep apnea. The engineer, William Rockefeller, told investigators he felt strangely "dazed" right before the crash, which occurred as he sped through a 30 mph curve at 82 mph. The engineer of a New Jersey Transit train that slammed into a station in Hoboken last September, killing a woman, also suffered from undiagnosed sleep apnea, according to his lawyer. Senate Minority Leader Chuck Schumer said he will push the federal agencies to reconsider withdrawing the proposed regulation. "We know from recent examples that if there had been testing for sleep apnea there would be people alive walking the face of the earth today who are not, unfortunately, because the engineer had sleep apnea," he said Tuesday at a news conference on Long Island. 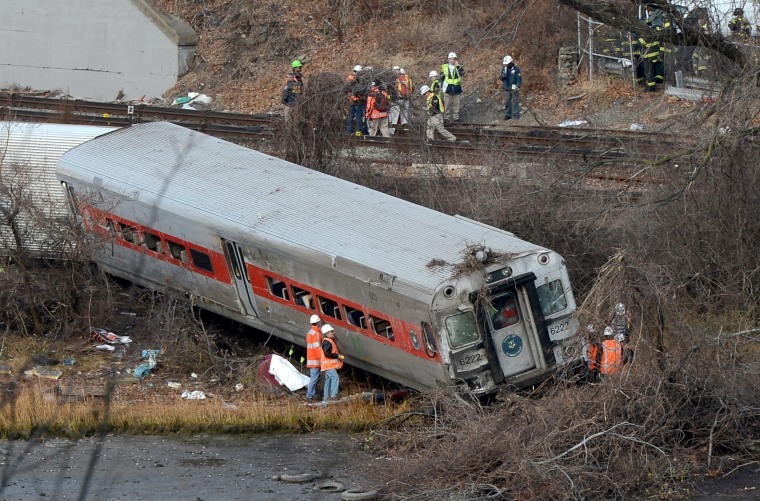 When asked by The Associated Press in a separate interview about the government's contention that businesses could enact their own testing policies, the New York Democrat said: "Tell that to the families of the people who died in Spuyten Duyvil," referring to the neighborhood where the Metro-North train crashed in 2013, killing four people. Marc Willis, a spokesman for the FRA, said the agency sought information from the public about sleep apnea and "believes that current railroad and FRA safety programs sufficiently address this risk." Feinberg said that isn't sufficient and the government shouldn't rely on industries regulating themselves. A notice posted in the Federal Register said the Federal Motor Carrier Safety Administration would consider updating a 2015 bulletin to medical examiners about the physical qualifications standard and respiratory dysfunction. Duane DeBruyne, a spokesman for the agency, declined to answer questions about the NTSB's concerns.